The NCAA Football Championship weekend will now include a live 90-minute concert named “CMT’s Ultimate Kickoff Party.” The television special will take place at the Kay Bailey Hutchison Convention Center in Dallas, Texas. The premiere is set for Friday, Jan. 9, 2015 at 9 p.m./Eastern on CMT. 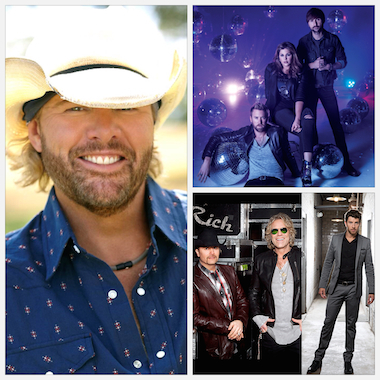 Scheduled to perform are Toby Keith, Lady Antebellum, Brett Eldredge, Big & Rich and more to be announced. The concert special marks a first-time partnership with CMT and College Football Playoff and is the kickoff entertainment event at the national championship playoff weekend. The inaugural College Football Playoff National Championship is on Jan. 12, 2015, at AT&T Stadium in Arlington, Texas.